Young Gifted and Black: ICYMI Arrests have been made in Canaryville, after this Racial Beating of Siblings in a Park. ICYMI Arrests have been made in Canaryville, after this Racial Beating of Siblings in a Park. 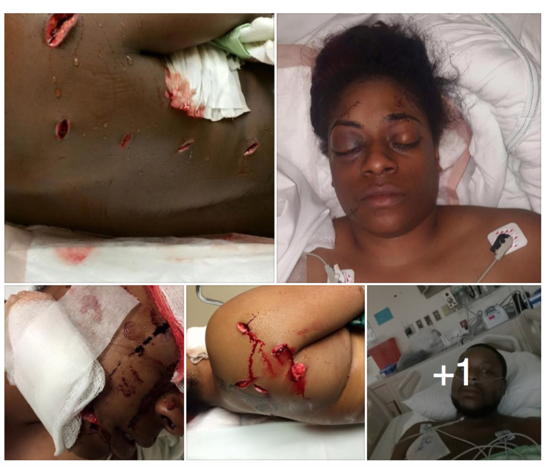 So I'm hearing that the attackers of that black brother and sister in a ChiTown park by a gang of white thugs, were arrested, it wasn't a hoax..furthermore., they should be charged with attempted murder..seems to me they were going for the kill while yelling the N word. These people that were attacked are overjoyed for the arrest, which they should be, but something tells me they are not quite privy to how the WS system TRULY works. May they have a speedy recovery, physically & mentally. On the morning of Saturday, May 30, 2015, my little brother, Marcus Fox, my daughter's father, Darrius Walton, and myself were sitting in Taylor Lauridsen Park conversing with 3 Caucasian people we had just met (Courtney, Kevin, and Jodie). Everyone was having a nice time. Approximately 7-9 more Caucasian people arrived in the park. My little brother being the social butterfly he is introduced himself and began chatting with the new arrivals. After about 30 minutes, one of the guys out of the group we initially met and another from the group that arrived later got into a verbal altercation with each other. My little brother tried to calm things down but this soon escalated as everyone began jumping on him. It was at this point things turned for the worse as he and I fought this massive group of Caucasians consisting of both men and women. They were throwing glass bottles, crutches, bricks, and anything else they could find at us. As we continued to fight through this crowd of assailants to get away, more Caucasians came from out of nowhere and joined in brutally attacking us delivering closed fist blows and kicks to our bodies and head. We began the fight of our lives. This MOB of around 20 Caucasians beat us until we were unable to move and left us laying in the park. My brother & I sustained multiple injuries. I was stabbed eleven times, eight times in the back & right shoulder, twice in the face & once in the head (which the knife was left lodged by one of the perpetrators). My brother was stabbed nine times, along his back, right side with one of the wounds causing him to have a punctured lung. NO ARRESTS have been made and the only publicity this received was an irresponsibly written 97 word article in the Chicago Sun-Times riddled with incorrect information. If the roles were reversed and had this been a mob of African Americans attacking two Caucasians this would have garnered immediate attention and been plastered EVERYWHERE. We have contacted news stations & have not heard back from anyone. This further proves that America believes- BLACK LIVES DON’T MATTER. Please HELP US GET JUSTICE for this hate crime! Please help us show that OUR BLACK LIVES MATTER! ‪#‎BlackLivesMatter‬ Please help us share our story.